I thought about starting another thread, called something like "They're really getting lazy", but decided instead to simply put this info here due to the Jupiter tie-in. Check out the ridiculous "artwork" adorning this article: http://news.discovery.com/space/earth-magnetic-field-shield.html . Without commenting on the content of the article (since it was the graphic that caught my attention) I'd like to point out the obvious, which is the "magnetic shield" the "artist" saw fit to bestow upon the Earth is the picture of Jupiter's aurora's, photoshoped (mirrored, rotated, whatever) that can be seen in the last picture on the right in this slide show: http://news.discovery.com/space/aurora-northern-lights-space-phenomena.html. That's both lazy and ugly. Come on Discovery, this is fantasy work after all - let's see some quality illustrations! You're getting smeared by the Elves! It might not look like much, but this is how a revival of the SEB begins--a small disturbance in the upper atmosphere heralds a much larger profusion of spots and swirls bursting forth around the whole circumference of the giant planet. Amid the confusion, Jupiter's vast brown stripe emerges. Subsequent observations by astronomers in the United States, Japan, and the Philippines not only confirm the plume, but also show it brightening rapidly. Indeed, as Nov. 11th unfolds, it is the single brightest spot on Jupiter in wavebands ranging from infrared to ultraviolet. "This plume is so energetic that we can confidently expect it to develop into the SEB Revival," says John Rogers, director of the Jupiter section of the British Astronomical Association. "The SEB Revival is usually spectacular, so we can expect impressive and rapidly changing disturbances over the next 3 months." Experienced planetary photographers are encouraged to monitor developments. If events proceed apace, the Revival could become visible to novices using small backyard telescopes, so stay tuned. Radio signals from Jupiter are not a sign of extraterrestrial intelligence. They occur naturally, caused by plasma instabilities in Jupiter's magnetosphere and fueled by powerful electric currents that flow between Jupiter and the volcanic moon Io. Admission - in one sentence - of Plasma events in Jupiter's Magnetosphere as well as Electric Currents flowing between Jupiter & Io! Last edited by nick c on Mon Dec 13, 2010 5:03 pm, edited 1 time in total. We should use this as a wedge to drive plasma cosmology into wikipedia. Last edited by Grits on Sat Dec 04, 2010 4:52 pm, edited 1 time in total. Well, really- what did you expect? That they would drop the current paradigm and embrace the Electric Universe? We're going to see more and more of these absolutely incontrivertible discoveries being made, but they are only going to be able to apply exactly what they discovered, and then everyone is going to work feverishly to try and incorporate it into the mainstreamist mindset. They are not going to be allowed to use it as a springboard for 'pseudoscientific' ideas like sustained currents between the gas giants and the Sun just because there are currents between the Earth and the Sun... there might be "unique physics" that account for this behavior, in their minds. 'Magic tornados' are just as valid an idea as Birkeland currents, unless you can either incontrivertibly prove the existence of the Sun-Earth electrodynamics, or incontrivertibly disprove 'magic tornados'. mainstream astrophysicist wrote: It has also long been known that there are no electric fields in the rest frame of that plasma [it simply shorts out]. The above quote relies on an electrostatics context, but space plasma has been repeatedly observed & measured as an electro-dynamic phenomenon. It's only in an electro-dynamic context that space plasmas can be properly understood. Plasma by definition is not "shorted out", rather, plasma is constituted of charged particles, and each charged particle has an electric force, also known as Coulomb force, denoted by a negative or positive sign. When charged particles' electric force interacts with magnetic fields, electric fields breakout and the resultant electric fields act to accelerate the charged particles as electrical currents. As long as there is plasma, the plasma has not been "shorted out" into neutral atoms. So, the astrophysicist's statement is an oxymoron. The reason for the admission is simple, astrophysicists have no choice: Electric fields & electric currents have been empirically observed & measured between Jupiter and Io. A flux tube is a generally tube-like (cylindrical) region of space containing a magnetic field, such that the field at the side surfaces is parallel to those surfaces. Both the cross-sectional area of the tube and the field contained may vary along the length of the tube, but the magnetic flux is always constant. Here is a peer-reviewed paper published in Astrophysics and Space Science (1988), which supports the proposition that Io’s volcanoes may be at least partially an electromagnetic plasma mechanism. Department of Space Physics and Astronomy, Rice University, Houston, Texas, U.S.A.
Abstract. Volcanic plumes on the Jovian satellite Io may be a visible manifestation of a plasma-arc discharge phenomenon. The amount of power in the plasma arc ( ~ 1011 W) is not enough to account for all the energy dissipated by the volcanoes. However, once a volcano is initiated by tidal and geologic processes, the dynamics of the volcanic plumes can be influenced by the plasma arcs. As initially pointed out by Gold (1979), plasma arcs are expected because of ~ 10 6 A currents and 400 kV potentials generated by the flow past Io of a torus of relatively dense magnetospheric plasma. We utilize our experience with laboratory plasma arcs to investigate the plume dynamics. The filamentation in the plume of the volcano Prometheus and its cross sectional shape is quantitatively consistent with theories developed from laboratory observation. The outbursts seen on Jupiter’s satellite Io have been described as volcanic eruptions. They may instead be the result of large electric currents flowing through hot spots on Io and causing evaporation of surface materials. A strictly periodic behavior would then be expected. lo had already called attention to itself by controlling decametric wavelength radio emissions. Previous attempts to explain this control assumed that the movement of lo, an object with high electrical conductance, through the Jovian magnetic field leads to falling electrical potential, particle acceleration, and a field-aligned current system [magnetic flux tube] coupling lo to the Jovian ionosphere. The force generated by the electrodynamic interaction is thought to accelerate lo in its orbital motion and slow the rotation of the Jovian ionosphere. The magnetic flux tube that threads through lo thus plays a critical role in the coupling of lo and Jupiter. Since lo’s orbital motion is not synchronous with Jupiter’s spin, the lo flux tube slips with respect to Jupiter and/or lo. Such slippage may result in an electric field parallel to the Jovian magnetic field that accelerates charged particles along the field, as occurs in the auroral regions on Earth. Intense, magnetic field-aligned, bidirectional, energetic (>15 kiloelectron volts) electron beams were discovered by the Galileo energetic particles detector during the flyby of Io. These beams can carry sufficient energy flux into Jupiter’s atmosphere to produce a visible aurora at the footprint of the magnetic flux tube connecting Io to Jupiter. Composition measurements through the torus showed that the spatial distributions of protons, oxygen, and sulfur are different, with sulfur being the dominant energetic (> approximately 10 kiloelectron volts per nucleon) ion at closest approach. Intense, magnetic field-aligned, bidirectional, energetic (>15 kiloelectron volts) electron beams were discovered by the Galileo energetic particles detector during the flyby of Io. A Birkeland current usually refers to the electric currents in a planet's ionosphere that follows magnetic field lines (ie field-aligned currents), and sometimes used to described any field-aligned electric current in a space plasma. They are caused by the movement of a plasma perpendicular to a magnetic field. Birkeland currents often show filamentary, or twisted "rope-like" magnetic structure. They are also known as field-aligned currents, magnetic ropes and magnetic cables). So, we have several papers that discuss the electromagnetic connection between Io and Jupiter via magnetic flux tubes (sometimes called Birkeland currents) which are an electromagnetic structure and two papers which specifically discuss Io’s volcanoes and the possible electromagnetic, free electrons & ions, plasma mechanism of those volcanoes. No reputable astrophysicist denies the Jupiter -- Io electromagnetic connection. And, numerous other interplanetary processes and phenomenon have been observed & measured which are indisputably electromagnetic in nature. Physical reality is trumping dogma! I apologize if this is a rethread of an older topic. It just caught my eye. Thanks to StefanR for gathering all the links together. We will combine eight Jupiter threads on the "Planetary Science" board, in this thread: "Electric Jupiter". 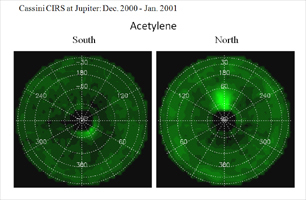 These images and movie show the distribution of the organic molecule acetylene at the north and south poles of Jupiter, based on data obtained by NASA's Cassini spacecraft in early January 2001. It is the highest-resolution map of acetylene to date on Jupiter. The enhanced emission results both from the warmer temperatures in the auroral hot spots, and probably also from an enhanced abundance in these regions. The detection helps scientists understand the chemical interactions between sunlight and molecules in Jupiter's stratosphere. These maps were made by NASA's composite infrared spectrometer. The Juno spacecraft is scheduled to launch aboard an Atlas V-551 rocket from Cape Canaveral, Fla., in Aug. 2011, reaching Jupiter in July 2016. The spacecraft will orbit Jupiter 32 times, skimming to within 3,100 miles (5,000 kilometers) above the planet's cloud tops, for approximately one year. I have no specifics about the Plasma and energetic particle detectors radio/plasma wave experiment. I wonder if these sensors could be described as Langmuir probes and plasma antennas? My question for NASA would be; can the local electric and plasma fields (which the space probe Juno is going to measure) partly explain the existence of the Jupiter's Magnetosphere? Juno is well on its way outbound to Jupiter now. Here is a nice 6 minute narrated video of the launch. You can choose 720p for a fairly hi-def picture. I love rocket launches. With luck, in 5 years Juno will go into orbit around Jupiter and start gathering really detailed data on the EM environment around Jupiter, much as Cassini has done for Saturn. One hopes it supports/expands on EU ideas about this planet and its system of moons, plasma and electrical currents linking them to each other and the Sun.